Read Proverbs 31 at Bible Gateway. 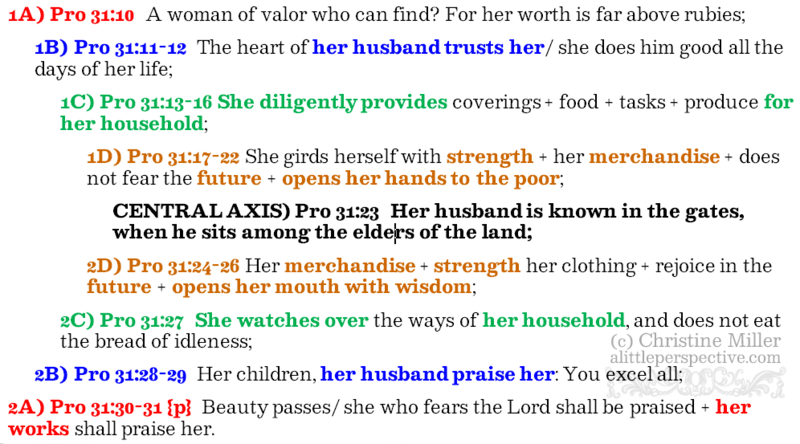 Now I was struck immediately with the fact that all our modern English Bibles call the woman, a woman of virtue, but the Hebrew Bible in English calls her, a woman of valor. The Hebrew word translated “virtue” or “virtuous” is Strong’s H2428, chayil, חַיִל, chet + yud + lamed. This is the same word we saw used over and over again in Samuel and Chronicles to mean the mighty men of valor! The Etymological Dictionary of Biblical Hebrew says that chayil is “to enable, to concentrate power and resources.” We actually saw this with David’s mighty men, because often times they were up against forces larger than they themselves; where they should have been defeated, but because of valor, they instead defeated their enemies. It is why their fame spread abroad. The ancient pictographs are of the fence + the closed hand that works or fights + the shepherd’s staff. The primitive root means “to bore,” as a tool called a bow drill was used in ancient days to bore a hole. The bow string wrapped around (fenced) the drill shaft (staff) and by twirling the string, the shaft bored the hole. How is this related to valor? When an army is faced with a wall, as in a walled city, or a man is faced with a giant, who is as a wall, an obstacle to overcome, it is valor that enables him to concentrate power or resources to bore a hole into that wall, and make a breach. Now, how is the woman who fears the LORD as a woman of valor? Chaos reigns in a house left to itself. The task of bringing order out of chaos, tidiness out of the ever pervasive accumulation of dirt and clutter, nourishing and delicious food to meet hunger which is never satisfied (because the next day you only have to do it again), and wise children out of fools, is a task that looms before a woman like a wall, every bit as daunting as a walled city. It is not beauty that will bore a hole in that wall to conquer it, but a woman who fears the LORD. I find it so interesting that the central axis for this paragraph is not about her, but about her husband. But isn’t that the point? She is his help meet, and her purpose in life is to serve and bless someone other than herself.